Inhabitants Goombas, including Red and Blue Goomba and Goomba King. The Goomba Road is a small road that leads to Goomba Village and Toad Town. 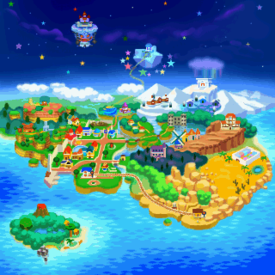 The road only appears during the events in the game Paper Mario. As Mario and Goombario travel through this path, they must fight off the notorious Goomba Bros. and the Goomba King, the first boss of the game, to continue their hike to Toad Town. The Goomba King's fortress is here, as are many secret items. Goomba Road is mostly an introductory area where basic skills are learned. The in-game map description reads, "This road from Toad Town leads straight to Goomba Village. There's a fortress built by the Goomba King on the way." In the prologue of the game, Mario and Goombario travel through this path, heading for Toad Town. An opportunity for the player to practice battling with a partner is also provided in the area. The first time Mario and Goombario encounter a battle here, the latter will comment that the order they attack can be changed by pressing . The first part of the road is a straight one. At the beginning there is a notice board with a picture of a Goomba and the text: "Beware of Goombas!" If Mario reads it, however, the Goomba will jump off the notice board. On the path are two Goombas, a ? Block, a brick, another ? Block and a Paragoomba. The second part of the road is also a straight one. First there is a Spiked Goomba, then a red ? Block containing the Close Call badge. After that there is a notice board with a Mushroom and hints on how to eat one. If Mario reads it, the Mushroom will jump off the board. Then come a Paragoomba and a Heart Block. 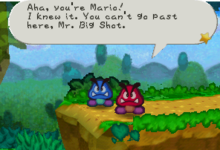 Red and Blue Goomba stopping Mario on the third part of Goomba Road. The third part of the road has a high platform in the right, a trampoline in front of it and a Save Block by the south side. Before Mario can reach the trampoline, Red and Blue Goomba appear and fight Mario. After they are defeated, they flee east. Mario and Goombario can then use the trampoline to get to the high platform and go east. The fourth part is a peaceful, straight one, with two notice boards. The first is a baiting one that shows a Mushroom and says, "Eat a Mushroom to regain your energy! ", but if Mario reads the board, the Mushroom will flip into a Goomba and jump out. The second states that Goomba King's Fortress is ahead. The Goomba King on his fortress. The fifth part has a gap, and is where Goomba King's Fortress resides. In the prologue, Mario and Goombario battle Goomba King here and find a switch in a nearby bush. After the switch is pressed, the fortress unfolds and forms a bridge, shooting Goomba King away and allowing Mario to cross the gap. After Mario leaves the area, ready to reach Toad Town, Kammy Koopa spots him and reports this to Bowser. Before the fortress is a tree with a Star Piece which drops when the tree is hammered. After the bridge is an open area, with an underground Star Piece in the northeastern corner and a lower area to the south. If Mario hammers the brick on the lower area, a ? Block with a Super Shroom will appear. The final part is a descending path consisting of stairs. By the south side of it is a ? Block containing a Sleepy Sheep. After the stairs, there is a pavilion that's part of Toad Town. By the pavilion is a tree with a trampoline. Hammering the tree makes the trampoline drop for Mario to use it to get to the roof of the pavilion. On the roof is a chest with the Hammer Throw badge. Once Toad Town is reached, Goomba Road plays no role in the rest of the storyline, except that Mario can return to it to collect items. It can also be used to go back to Goomba Village, but not necessary as one of the warp pipes in Toad Town Tunnels links to Goomba Village directly. For enemy formations in Goomba Road, see here. Close Call In the red badge block on the second part of the path. Hammer Throw In a chest box on the roof of Toad Town entrance; get it by hitting the tree for a trampoline. Mushroom Jumps off the notice board near the second part of the path when Mario finishes reading it. Star Piece In the tree before Goomba King's Fortress. Under the hidden panel in the north of the opening after Goomba King's Fortress. Super Shroom To the south of the opening after Goomba King's Fortress, there is a brick hitting which will reveal a ? Block with this item. Sleepy Sheep In the ? Block near the descending stairs between Goomba King's Fortress and Toad Town. There are lots of bad Goombas around these parts. Did you know... ...there are good Goombas and bad Goombas? A bad Goomba will try to pick a fight with us the second it spots us. Look, Mario! There's a Save Block. Might be a good idea to use it, don't you think? If we go east a bit farther, we'll find a bridge. Once we cross it, we'll be a hop, skip and a jump away from Toad Town. I think there was a bridge between Toad Town and Goomba Village. If we head east, we'll get to Toad Town. If we head west, we'll come to my house in Goomba Village. Ah, the outskirts of Toad Town. To the east is Toad Town. If we go west, we'll reach my hometown, Goomba Village. Mario getting the Close Call badge on the second part of Goomba Road. The Star Piece in the tree before Goomba King's Fortress. The Star Piece after the bridge.